Denver has an incredibly wide selection of music venues to suit any age or taste. Browse our listings to find your next favorite artist or hotspot. These are your mainstream venues, the arena-sized spaces that bring in the biggest acts like Taylor Swift, Adele, George Strait, the Foo Fighters and Lil Wayne. This venue needs no introduction. Red Rocks Amphitheatre is America&apos;s best outdoor amphitheater, according to Rolling Stone magazine. It&apos;s hosted such luminaries as U2, Jimi Hendrix, the Beatles and the Grateful Dead. 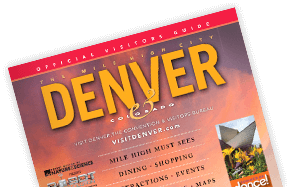 Celebrating its 75th anniversary in 2016, it&apos;s a top destination for Colorado residents and tourists from around the world. It&apos;s close to Golden and just 15 miles from Denver. Opened in 1999 with a Celine Dion concert, this music venue is located in the heart of Lower Downtown (LoDo) Denver. During the winter season, the Pepsi Center is used mostly for sporting events (NBA&apos;s Denver Nuggets and NHL&apos;s Colorado Avalanche), but during the spring, summer and fall, expect to find some of the biggest names in music gracing the stage. Just a few minutes&apos; walk from downtown Denver, you can expect to enjoy good concession food, drinks aplenty or even a meal at one of three restaurants located inside the venue. Denver is known for hosting outdoor music venues featuring amazing acts. Besides Red Rocks Amphitheatre, of course, we also have a few other outside spaces that host some of the biggest acts in music today. Fiddler&apos;s Green Amphitheatre, situated just south of Denver in Greenwood Village, was commissioned by the Museum of Outdoor Arts in the 1980s and was built as a large-scale earth sculpture with rolling grassy slopes and stunning views of the Rocky Mountains. Grab a cold beer and a blanket, take a seat on the giant lawn or buy a reserved seat, and watch the sunset as you listen to your favorite band belt out a beautiful tune. Located just a short drive up Highway 36 in Broomfield, the 1st Bank Center is the premier mid-sized event venue near Denver, which holds up to 6,500 people. Opened in 2010, this venue hosts musical acts of every genre, from electronic to country to rock ‘n&apos; roll. Make sure you double-check the fine print when buying your tickets. Floor tickets are standing room only in front of the stage while bowl tickets are seated tickets surrounding the standing floor and facing the stage. These are the best mid-sized music and concert venues in Denver, each with their own personalities, hosting music acts of a variety of genres for discerning crowds. Located one block down from the Ogden Theatre, the lush Fillmore Auditorium is one of the bigger music venues in the Capitol Hill neighborhood and has grown to become one of the prominent music venues in the city. When you walk into the venue, be prepared to be in awe of the stunning chandeliers that hang from the ceiling. With a giant main floor surrounded by an upper level facing the stage, this is another general admission venue, offering lots of room to dance and enjoy a show that can hold up to 3,700 concertgoers. Grab your favorite cocktail from one of the bars and enjoy the stunning atmosphere of this incredible venue. The Capitol Hill neighborhood is known for good coffee shops, a plethora of fine restaurants to make any foodie swoon, and awesome music venues. The Ogden Theatre is one such venue hosting anywhere from two to five shows per week. Located on East Colfax Avenue, the longest continuous street in the United States, this venue is general admission only, so make sure to get there early to find the perfect floor space. One night you&apos;ll find a crowd of hipsters enjoying PBR&apos;s and listening to indie music, and the next night you&apos;ll see a younger crowd adorned in glow sticks and furry boots jamming out to electronic music. The Ogden is a theater for all ages and genres, so make sure to check out the event calendar to find some great shows. Built back in 1913, the Bluebird Theater was originally a movie house before being redone in 1994 and reopened as the music mecca that we know today. Located on East Colfax and fronted by a not-to-be-missed neon marquee, this venue is laid out in tiers with a balcony that can hold a few hundred people overlooking the entire space, so there truly are no bad views. With a diverse lineup of artists throughout the year, you&apos;re sure to find a show to tickle your music fancy. Grab a bite to eat before the show at some of the great restaurants right around the venue and then have your choice of cocktails at the theater. The Gothic Theatre began like the Bluebird Theater as a movie theater that was the first to show "talkies" in Denver in the 1920s. In 1998, the theater was renovated from top to bottom while keeping the historic interior intact. When it reopened its doors a year later, the Gothic made its mark once again now as a renowned music venue. Located in Englewood (just take Broadway south from downtown), this theater has a tiered downstairs balcony and a tiered upstairs balcony, offering a lot of room for patrons to stand or sit and enjoy the show. Like many other venues of this size, the Gothic covers a wide variety of music from indie to electronic, from rock to folk, and much, much more. Denver&apos;s neighborhoods are vibrant and diverse. Some clubs are new while others are restored historical masterpieces. Neighborhood: Just a few blocks from Coors Field in the heart of the growing part of LoDo surrounded by Market and Larimer streets, the Ballpark neighborhood offers some of the liveliest bars in the city. Fun fact: Ophelia&apos;s Electric Soapbox used to be a brothel back in the day and since the new owners moved in they&apos;ve kept the risqué theme of the building to match its history. Ophelia&apos;s doubles as one of the hottest restaurants and bars in Denver, owned by the same people who serve delicious dishes at Linger and Root Down. Enjoy having a cold beverage while sitting on the upper-level overlooking the stage or head on downstairs to join other patrons on the dance floor. Neighborhood: In the midst of all the hubbub of LoDo, surrounded by the bright lights of two-story bars, El-Chapultepec might go unnoticed to the untrained eye, but anyone who wants good jazz or R&B knows this is the place to go in the city. Fun fact: This music venue has been a downtown landmark since 1933. While locals go here for the surefire good music, it&apos;s also a great place to grab some incredible American and Mexican food during the week. Neighborhood: Surrounded by all the goodness that South Broadway has to offer, from amazing dive bars to swanky, award-winning restaurants and everything in between, Hi-Dive fits right in. Fun fact: The Hi-Dive opened its doors in 2003 and became a local institution in short order. Many top local bands still return to the place where they began and love the incredible sound system. Neighborhood: This new venue opened in 2015 in the RiNo neighborhood and boasts that it&apos;s a place where music, drinking and dining collide in. Fun fact: This jazz-based venue is the result of a big dream and a lot of support from community founders. In an effort to give back to the community, Nocturne partners with local non-profit organizations to help provide educational and musical opportunities for Denver area youth by offering its stage space for concerts, workshops and rehearsals. Neighborhood: This local jazz venue is just around the corner and up the street from most of the other Capitol Hill/SoCo venues. Fun fact: DazzleJazz is the premier place for jazz in Denver and it has been listed as one of the Top 100 jazz clubs in the world - yes, the world - by DownBeat magazine. The venue continues to bring in the best in the business. Don&apos;t worry about a bad seat in the house because there isn&apos;t one, and the food and drinks are raved about as much as the amazing music. Neighborhood: Located in the heart of LoDo, Summit Music Hall is down the street from Coors Field and sits right in the hub of many popular bars such as ViewHouse, Tavern Downtown and 1up LoDo. Fun fact: Summit Music Hall hosts a lot of shows for all ages. Many days you can drive past the venue and see kids waiting outside to get tickets to their favorite rock shows or parents and kids attending shows together. Neighborhood: Finding its second home in the Lowry neighborhood, Soiled Dove Underground has made huge improvements since moving from LoDo. Fun fact: The semicircle stage has three tiers that face the stage to give all concertgoers a great experience. Let&apos;s not forget its state-of-the-art sound system that is unlike any other in the city. Neighborhood: Surrounded by other great bars such as The Matchbox and Cold Crush, the Meadowlark Bar is right in the midst of the growing LoDo neighborhood. There are a good dozen restaurants in walking distance from the venue where you can grab a bite before a show. Fun fact: The music is mostly played in the basement of the building, a unique feature, which is what sold the owner on buying the spot. The owner wanted a place that had warmth and a sensation of comfort. But during the day, you can also find the outdoor patio alive with music and drinks. Neighborhood: Vinyl is cozied right on the same two blocks as other venues like City Hall and Bar Standard and around the corner from The Church Nightclub in the Capitol Hill/SoCo (South of Colfax) neighborhood. If you&apos;re feeling the need to experience a few music venues on the weekend in one night, this is the area to be in. Fun fact: The venue has four floors of throbbing dance music, including a great rooftop patio with year-round fire pits and stunning views of the mountains. It&apos;s a perfect place to watch sunsets while jamming away to your favorite artists. Neighborhood: The Church Nightclub is just a hop, skip and jump from three other amazing music venues within the ever-popular Capitol Hill/SoCo neighborhood. Fun fact: This was an actual church built in 1865 and converted into the beautiful music establishment that it is today. The stained glass windows and burning candles give it a unique ambiance that caters to music worshippers. Neighborhood: Not to be confused with the center of city government, City Hall is a thriving venue and is part of the Capitol Hill/SoCo nightlife district. Fun fact: The City Hall events venue also hosts many events like politicians&apos; election parties, 303 Magazine Fashion Weekend and film screenings. Neighborhood: This venue, located in the Capitol Hill/SoCo neighborhood, is known for its diverse crowds and has a rooftop deck with spectacular views. Fun fact: The club is housed in the former Jonas Bros. Furs building. While it&apos;s a bit deceiving from the outside, the venue hosts a sounds system and dance floor for the books. Neighborhood: In historic Five Points, this venue pulls double-duty with two venues in one location. Fun fact: The Cervantes&apos; side of the venue brings in the bigger acts because it can hold larger crowds with a sizeable dance floor and an open balcony overlooking the stage, plus one of the biggest disco balls you&apos;ve ever seen! The smaller Other Side is the more intimate venue that only holds roughly 400 people. But don&apos;t let its small size fool you, it also hosts some pretty big names and are only separated from Cervantes&apos; main room by a door. Neighborhood: Located in the River North Art District (RiNo) "where art is made," this up-and-coming area boasts some of the hottest restaurants and bars in the city. Fun fact: In 2014, Casselman&apos;s Bar & Venue made the decision to offer a more intimate music experience by converting the front of their venue into a new stage dubbed "the north end at Casselman&apos;s." With the stage, the venue is set to host significantly more music events. Neighborhood: This Denver dance club is a few short blocks from Coors Field and is kitty-corner to Summit Music Hall in LoDo. Fun fact: In 2013, Rolling Stone named Beta the best dance club in America and the venue continues to rank in the Top 100 of best dance clubs in the nation on an annual basis. If you go to the venue you will experience a top-notch audio, visual and lighting effects system. Neighborhood: Known for its antique shops and proximity to the University of Denver, the South Broadway neighborhood offers quaint restaurants, fun local bars and funky, on-the-fringe shops. Fun fact: Herman&apos;s Hideaway has been around since 1962 and has hosted more than 25,000 bands since it opened its doors. This venue always has people grooving on the dance floor and singing along to the lyrics of many local bands. Neighborhood: Located just north of Denver, take a drive straight up Interstate 25 where you can see this country music venue from the highway. Fun fact: Denver really does love country music and it&apos;s evident at this venue that hosts live music six nights a week. Need to brush up on your two-step? Head to the Grizzly Rose on Wednesday nights to receive free dance lessons at this venue ranked among the top in the nation by the Country Music Association. Neighborhood: Located on Havana Street in Aurora, this venue is out in the suburbs with easy access to Interstate 225. Fun fact: The venue likes to say it&apos;s "two steps above the rest" and has been one of Denver&apos;s premier country dance clubs since 1992. Stampede is known for its ladies night every Wednesday and has a two-level, 35,000-square-foot space that can hold up to 1,200 people. Neighborhood: Just a few blocks from the Gothic Theatre near South Broadway, this intimate venue has called the neighborhood home since 1979. Fun fact: Swallow Hill is a non-profit music organization. Besides being a space for music shows, the organization brings the community together through its outreach, school programs and concerts. Neighborhood: Located just blocks from City Park on East Colfax, Lost Lake Lounge has become a renowned hangout for locals and visitors alike. Fun fact: It looks rustic from the outside, which only adds to the character. And don&apos;t let the full wood bar fool you, the bartenders serve up some stiff drinks to go along with the rocking music. Neighborhood: The Marquis Theater can be found in the heart of LoDo&apos;s Ballpark district on the corner of Larimer and 20th streets. Fun fact: Most of the shows at the Marquis are for all ages and the venue&apos;s promoters do a great job of lining up acts that cater to younger concertgoers. There&apos;s also a nice little pizza joint in the front lobby, so be sure to grab a slice before, during or after your show.